The cemetery is open daily from dawn to dusk. The tone in which my four-year-old son poses the question is no different than if he were asking to visit the playground or a friend’s house or the colony of stone turtles in the park down the street. He asks with the full expectation of pleasure—adventure even—and without the slightest consciousness of morbidity. He asks because the place he has in mind is for the living. I’m raising my kids, it seems, to be lovers of cemeteries. I should be specific. Lovers of one cemetery, where, at any given hour, amorous lawyers are sitting down to a picnic, droves of dogs are bounding past headstones, bird watchers are squinting for glimpses of hawks and yellow-bellied sapsuckers, and children are sliding toboggan-style down the grassed-over slopes of old burial vaults. A place where the city of the dead walks in the light of day. 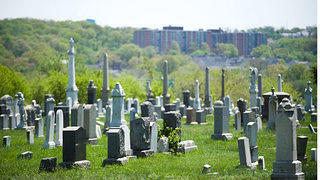 Created in 1807, Congressional Cemetery is, despite its name, a privately owned 35-acre tract, rising at the exact point in Southeast Washington, D.C., where the city sloughs off its urban grid and bristles up into forested hills. Standing at the cemetery’s summit, you can look down on the Anacostia River and, across the river, to the rumpled beech and maple woodlands of Fort Dupont Park. The altitude is enough to make the place quiet without being…funereal. Traffic on the Southeast Freeway produces a steady liquid noise, and even on breezeless days, there’s an oak tree near the chapel that never stops shaking its leaves. I have seen those leaves whirring well into February—brown and still game. More than 67,000 people are buried here—and it's still active. It would take you no more than 10 or 12 minutes to drive here from the Capitol, and yet I would guess that most members of Congress have never made the visit (alive, anyway) and that many Washington residents don’t even know this cemetery exists. I certainly didn’t. I had lived on Capitol Hill a good three years before I stumbled upon the place, driving back from the local grocery. First I saw an arched iron gate, with the words “Congressional Cemetery” displayed in the simplest sans-serif type. Then I saw a gatehouse, and as I drove down the lane called (fittingly enough) Congress Street, I found, rising up on my left, a curious row of sandstone boxes with what looked like conical beanies: cenotaphs, I would later discover—literally, “empty tombs”—designed by Benjamin Latrobe not simply as graves (though roughly half of them are) but as commemorations of the solons of the early Republic. Memorials for Henry Clay and George Clinton are located at Congressional, and although those names had a patriotic appeal, there was something about the cemetery itself that attracted me: its uncertain dance between stateliness and decay. My car, passing down Congress Street, reverberated against man-sized potholes. Most of the trees that had once flourished here had been cut down. Overgrown grass, shattered tombstones, worn epitaphs—all the usual symptoms of cemetery mortality were in plain view—and still I warmed to the place, and the more I learned about it, the more it schooled me. Get more stories like this one, delivered straight to your inbox. Sign up today. From its earliest days, Congressional Cemetery (or as it was known originally, the Washington Parish Burial Ground) belonged to Christ Church, a local Episcopalian parish. But by virtue of its proximity to the Capitol, it soon became a way station for dead statesmen. Travel being an iffy business, and flesh being corruptible, the bodies of such luminaries as John Quincy Adams and William Henry Harrison would be left in the cemetery’s public vault for weeks, even months, on end—free of charge—until such time as they could be transported to their hometown plots. Dolley Madison cooled her heels for six years in the Causten family vault before her remains made it back to Montpelier. Her profligate son followed not long after. Concordances and discordances like these kept bringing me back, and whenever friends came to visit, I would drag them there, too, with an eagerness that must have struck them as unseemly. What I didn’t realize was that I was actually fulfilling the founders’ intentions. The cemetery made it on the National Trust's 1997 list of America’s 11 Most Endangered Historic Places, which put it in the spotlight. 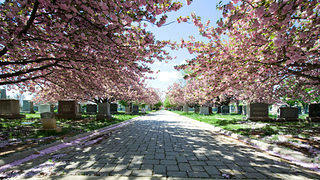 Cemeteries, for most of us 21st-century citizens, are strictly utilitarian places. We come, we go, as quickly as propriety allows. By contrast, many of the great garden cemeteries of the 19th century were conceived by landscape architects steeped in Romanticism. The undulating paths are richly varied woodlands were designed to attract the eye and the visitor. And indeed, the people who flocked there by the thousands were only rarely in a mood to mourn. Lovers wooed along the shaded lanes; families, gaily dressed and giddy at escaping the city’s miasma, dragged blankets and picnic baskets after them. Weddings happened here, concerts, sporting events. Hard as it is to believe now, cemeteries were America’s first parks. It was a concept I was slow to grasp myself until I took the signal step of acquiring a dog. The first time I brought my black Labrador, Josie, to Congressional Cemetery, I was astonished by the transformation that overtook her from the moment I let her off leash. A dog that normally insisted on a complicated and byzantine ritual of sniffing before exploring any new space tossed her head back and broke into a thoroughbred gallop, hurdling grave markers as she went. I didn’t see her for another half-hour. We are raised to revere the dead, which is why I was a little unsettled to see how irreverently Josie combed this pleasure ground. Every time I saw her peeing on some headstone, the impiety gnawed at me. (Maybe this was protected speech?) But in fact, another truth was just waiting to be discovered. Dogs are Congressional Cemetery’s salvation. In recent years, cemeteries across America have had a hard time making ends meet. Lawn care, new plantings, marker restoration—these things cost money, which is often in short supply. And although Congress periodically appropriates funds for Congressional’s upkeep and maintenance, this repository of history has come to depend partly on the kindness of some 400 pet owners, who freely shell out a minimum of $225 a year to let their poodles and Airedales and corgis relieve themselves in the Elysian Fields. 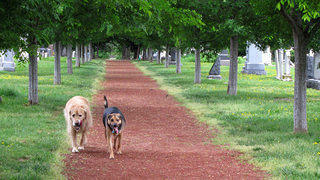 Some 750 dogs have the privilege of romping around the cemetery off-leash. It is, as any local will tell you, a deal. 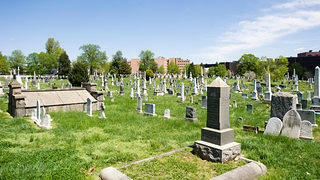 Congressional Cemetery is one of the few truly fenced-in areas on Capitol Hill. (Good thing, too: the D.C. Jail lies on the other side.) Here you have the luxury of letting your pooch off the leash without ever worrying about traffic or police or indignant neighbors. Dog owners, as a consequence, have become a force in the cemetery’s preservation associations, assisting in restoration work and, equally important, ponying up money to keep the grounds thriving. The results are easy to see: groomed grass, rehabilitated tombstones, newly planted saplings, and an esprit de corpse that makes Congressional Cemetery one of the happier urban spaces in which to while away an hour or two. The mutts, in short, are here to stay, and Congressional is, essentially, an oversized dog park, with all the cultural apparatus that signifies: steaming thermoses of coffee on bitter-cold mornings, the strange quasi-intimacy that enables you to know a dog’s name but not its owner’s, the truly parental fervor with which white-collar professionals debate the nuances of choke collars and puppy socialization. Which, of course, was my son’s age too. He asked me how a child so young could have died. I reassured him that in the old days, doctors didn’t have medicine to help the kids who were sick, but now they do, so those kids don’t die anymore, and neither will you … on and on I went, only to realize that the subject of death was not just scary to him but deeply interesting. And so we talked for some time, and in the usual manner of children, he made me see how strange and arbitrary the whole business can look to the uninitiated. “They put them in a box? Then they put them in the ground? They pour dirt on top?” And I came to understand that it was the vibrant space of Congressional Cemetery that allowed my son’s questions to emerge in such an unforced way. None of death’s mysteries or terrors dissolved, of course, in those 15 minutes, but death could at least be looked at, without flinching or moralizing or temporizing. In the midst of death, says Congressional Cemetery, we are in life. Not only are cemeteries and burial grounds important to everyday American life and culture, but they're also present in nearly every community. Interesting in saving one near you? Here are 10 tips. Louis Bayard is the author of the novels Mr. Timothy and The Pale Blue Eye. A previous version of this story, originally titled "The Graveyard Shift," first appeared in the May/June 2007 issue of Preservation magazine.